4-electrodes spark plug which provides 4 times more benefits. The F3+1 plug is unique. With 4 double copper electrodes and slippery spark technology, it addresses several technical challenges in a single design. Combining the reliability of a main ground electrode with three smaller ones, the F3+1 easily overcomes potential fouling for a high quality combustion. The combination of the “main electrode” and “side electrodes” architecture helps cut emissions. The main electrode can be adjusted to perfectly suit a wide range of both old and new applications. The cooled electrodes wear more slowly, so plug performance remains at its peak for longer. The plug’s cooled electrodes delay the incoming of possible combustion problems, which can damage high-performance and heavy-duty engines. With its slippery spark technology, the F3+1 plug ensures better starting even in the lowest temperatures. The F3+1 plug optimizes combustion to cut fuel consumption and harmful exhaust emissions. Peugeot et Citroën have chosen F3 + 1 technology as original equipment to meet cold start constraints on their new generation engines. 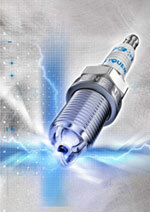 Our spark plugs range (about 250 references) covers the whole European car market.